This is the zinc steel model which is cheaper and great for anyone on a budget. The sliding doors is what makes this model unique. 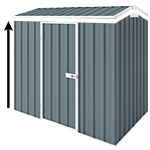 It allows easier access especially if the shed is in a tight alley or crowded spot because the doors don’t have to open outwards.